Seek out Alduin within Sovngarde. Once you've entered Sovngarde, continue down the path. Find out how to defeat Alduin. Gain admittance to the Hall of Valor. Talk to the heroes of Sovngarde. You are transported to a misty realm filled with statues of Nord warriors. The mist has no noticeable effect on you and can be temporarily cleared with the Clear Skies shout, but it quickly rematerializes. Upon continuing down the stone steps, you may be stopped by a Stormcloak soldier who says that the mist is extremely dangerous and that you should not go into it. He died fighting the Imperial Legion, and all his companions have been swallowed up by the mist, where he says Alduin lurks, devouring souls. He also tells you that at the end of the valley of mist lies Shor's Hall, where the heroes of Sovngarde gather. He begs you to allow him to follow you. True enough, Alduin will periodically swoop in and grab a fallen Stormcloak or Legion soldier in the misty valley. On the way, you may encounter historical figures such as High King Torygg and Svaknir, along with NPCs that have died in the course of the game, such as Kodlak Whitemane, Ulfric Stormcloak, Legate Rikke, or Galmar Stone-Fist. Once clearing the mist, you'll reach the edge and be stopped by the gate guardian, Tsun. He challenges your right to enter the Hall of Valor and declares that you must prove your worth in a warrior's duel regardless of the right that you claim. 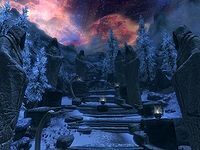 The first claim 'by the right of birth' will always appear regardless of what you have done in the game, but the remaining ones can only be used if you have completed the quests of the Companions, the College of Winterhold, the Dark Brotherhood and/or the Thieves Guild, respectively. By the right of birth. I am Dragonborn. "Ah! It's been too long since last I faced a doom-driven hero of the dragon blood." By right of glory. I lead the Companions of Jorrvaskr. "I welcome the chance to challenge the blade of Ysgramor's heir, honored shield-brother/shield-sister to Kodlak Whitemane, whom I've watched for in vain." By right of Cleverness. I am Master of the College of Winterhold. "Well met, mage of Skyrim. The Nords may have forgotten their forefathers' respect for the Clever Craft, but your comrades throng this hall. Here in Shor's house we honor it still." By right of blood. I Listen for the Night Mother.† "You trespass here, shadow-walker. Shor does not know you. Perhaps before the end you will earn the right to pass this way. Welcome I do not offer, but your errand I will not hinder, if my wrath you can withstand." By right of plunder. I am a Nightingale of Nocturnal.‡ "Do not mistake the night-shrouded thief's stealthily-taken spoils, stolen and unearned, for a warrior's plunder, won in honorable battle. Your doom already binds you to your dark mistress, but your errand I will not hinder, if my wrath you can withstand." † Also requires Hail Sithis! to be completed. ‡ Only requires Trinity Restored to be completed. He is fast and deals an enormous amount of damage, so if you are having trouble beating him, you can run back down the steps and into the water, as he will stand at the edge and be unable to attack you. Fire spells work particularly well against him. You do not need to initiate conversation in order to earn entrance, which provides an opportunity to do ranged attacks from the start. Inside, you are greeted by Ysgramor, founder of the Companions and harbinger of men, who asks you to speak to the Nord heroes of old who battled Alduin (as seen in the Elder Scroll): Gormlaith Golden-Hilt, Hakon One-Eye, and Felldir the Old. 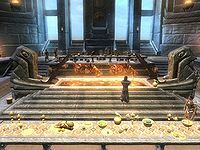 The Hall is filled with Heroes of Sovngarde, including some very notable ones like Jurgen Windcaller, Olaf One-Eye, and Ulfgar the Unending. When you meet with the three heroes that you are directed towards, they decide to join Shouts with you to clear the mist from Sovngarde. The quest ends with you running out to join them near the misty valley. It is possible to jump onto a rock hanging over the waterfall and make Tsun fall to his death, or shove him off the platform with Unrelenting Force. However, he will merely respawn in front of the Hall of Valor. On your way to the hall of Valor, he may stop you on the bridge and congratulate you. If you try to cross the bridge before Tsun grants access, you will be killed by lightning strikes. Do not try to climb down the mountain around the Hall (on either side) - you will be instantly killed if you go below a certain height. On the tables in the Hall of Valor, you can find a Roasted Ox Head and two Roasted Ox Legs, the only ones available in the game which you can take. If the player uses mist form as a vampire lord during this battle he will yield and allow them to cross (this requires enough progress in the Dawnguard quests to allow the player to become a vampire lord). 10 I've passed through Alduin's portal into Sovngarde, the realm of Aetherius where the souls of Nord heroes go to feast and battle until the final reckoning. Now to find Alduin and defeat him once and for all. 50 I've passed through Alduin's portal into Sovngarde, the realm of Aetherius where the souls of Nord heroes go to feast and battle until the final reckoning. Alduin has laid some kind of soul-snare across the valley of Sovngarde, a mist where he hides and feeds upon the trapped souls. My only hope is to reach the Hall of Heroes. 200 Finishes quest I've passed through Alduin's portal into Sovngarde, the realm of Aetherius where the souls of Nord heroes go to feast and battle until the final reckoning. Alduin has laid some kind of soul-snare across the valley of Sovngarde, a mist where he hides and feeds upon the trapped souls. I reached the Hall of Heroes and met Gormlaith Golden-Hilt, Hakon One-Eye, and Felldir the Old - the three heroes who I saw defeat Alduin in my vision of the past. They have been permitted by Shor, the god of the underworld, to join me in my battle against Alduin. The following empty quest stages were omitted from the table: 0, 1, 5, 20, 30, 60, 65, 70, 75, 80, 85, 90, 95, 100, 105, 110, 130, 135, 140, 160, 170, 180, 300. On the PC, it is possible to use the console to advance through the quest by entering setstage MQ304 stage, where stage is the number of the stage you wish to complete. It is not possible to un-complete (i.e. go back) quest stages, but it is possible to clear all stages of the quest using resetquest MQ304. This page was last modified on 4 March 2019, at 23:45.